Popcorn is a quick and delicious snack that’s easy to make when the craving strikes. The problem with some popcorn, like microwave popcorn, is that it is often loaded with butter and salt, both of which can mean trouble for your heart health. However, popcorn is also a whole grain, meaning it is full of fiber and is great for helping to lower your blood pressure. The trick is popping and flavoring your popcorn with heart-healthy ingredients. 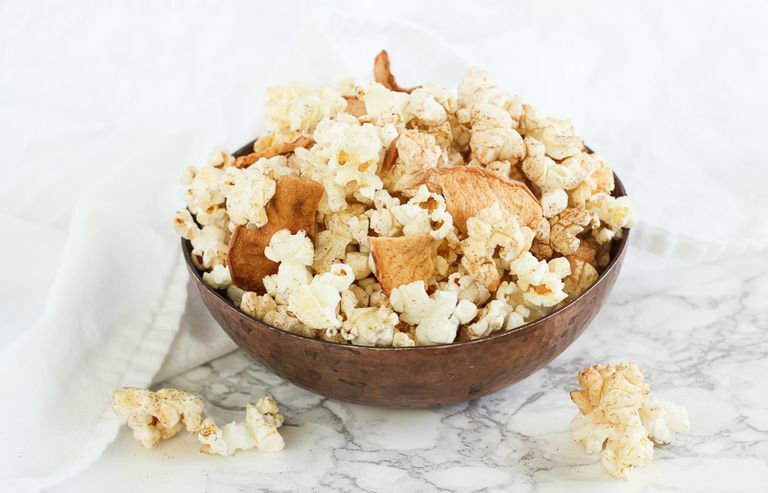 This apple cinnamon popcorn is popped on the stove with heart-healthy oil. It is really quite easy to make if you’ve never tried popping popcorn on the stove. It is tossed with cinnamon and unsweetened apple chips for a tasty, fall-inspired treat. Heat oil in a small saucepan over medium heat. Add one or two popcorn kernels to the pan. Once they pop, add remaining popcorn to the pan. Cover with the lid and shake until you hear the popping slow. Watch carefully as popcorn can burn quickly. Remove from heat and add cinnamon and apple chips. Toss to coat. Pour into bowls for serving. Try adding ground ginger, nutmeg, or cloves for even more spice. Try banana chips, dried coconut, or dried mango slices in place of the apple chips for a tropical popcorn mix. When choosing, make sure there's no added sugar. If you prefer a savory mix, try adding beet or carrot chips and savory spices such as chili powder, paprika, pepper, or garlic powder. This popcorn is great for snacking on during your next movie night or for packing with you to munch on when you are on the go. Experiment with different spices and dried fruit to find your favorite flavor combination. Watch popcorn carefully while popping. It can burn fast! It is normal to have a few unpopped kernels in the bottom. Be careful when uncovering popped popcorn. There will be hot steam escaping.